Published in 2004 by Mad Norwegian Press. We all remember Resurrection Day. Even now, three centuries later, we cannot forget that awakening: our bewilderment, our terror and our joy. Each of us had experienced death, imagining ourselves bound for oblivion, Heaven or Nirvana, according to taste. Instead, we found, each member of the many human species – from tool-wielding australopithecines to posthuman philosopher-gods – had been harvested, gathered here by the Founders’ unfathomable technologies. We may be certain, therefore, that these rumours of a murder (the brutal stabbing of a City Councillor, no less!) are nothing more than lurid fabrications. The supposition that the murder weapon is missing, or that it could have been – as hysterical conjecture has claimed – a “potent weapon”, capable of injuring a Citizen within the haven of the City, is equally absurd. The idea that a guerrilla war has already begun in one of our less harmonious enclaves need not be dignified with refutation. Please go about your business, Citizens, as normal. We are perfectly safe, here in the City. Humanity has never been safer. Of the City of the Saved... is not a novel of violence and political intrigue, set against the backdrop of humanity’s last resting-place. 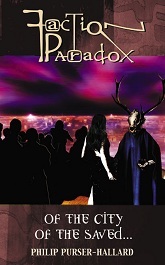 There is no evidence that it is the second in the series of original Faction Paradox novels. 2013 ebook edition: This is a revised version, incorporating corrections and restored material, as well as some extras from this website. Read the official Preview to Of the City of the Saved... .
Read Deleted Scenes and Commentary. See unofficial Illustrations by Nick Hallard. Read a slightly more descriptive alternative back cover blurb. Read an additional short story, ‘Unification Theory’, set during the action of Of the City of the Saved... and featuring characters from my Bernice Summerfield novella ‘Predating the Predators’. Read the author biography from Of the City of the Saved... .
Read online reviews of Of the City of the Saved... .
Buy Of the City of the Saved... from Amazon.co.uk, Amazon.com or Mad Norwegian Press. NB: The short story ‘A Hundred Words from a Civil War’, published in the Faction Paradox anthology A Romance in Twelve Parts , is a sequel to Of the City of the Saved... .
All material © Philip Purser-Hallard 2003 and 2004 except where otherwise noted, and not to be used without permission. Of the City of the Saved... cover © Steve Johnson 2003.